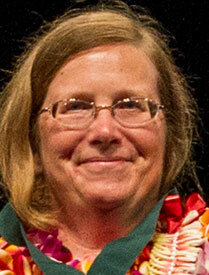 Karen Meech, an astronomer at the Institute for Astronomy at the University of Hawaii at Manoa. Meech has been a pioneer in observing the behavior of comets. Her research bridges the boundaries between astronomy, planetary science, geology and astrobiology. Her work investigating the leftovers of the planetary building process has contributed to the understanding of the conditions during the time our solar system was put together. Meech’s expertise led to her participation as a co-investigator on three NASA comet missions where she led the Earth’s observing campaigns. She has catalyzed a large interdisciplinary research program in astrobiology at UH, investigating water and habitability. In particular, she has led the development of space mission concepts focused on the big-picture questions surrounding the origin of Earth’s water. Her research has been recognized with the Harold C. Urey Prize, among several other awards. The American Association of Variable Star Observers recognized her service to teaching and outreach through the William Tylor Olcott Award.